To me, the Hurricanes are one of those "tweener" teams in the National Hockey League. They’re not good enough to be a playoff contender yet not good enough to clean up in the NHL Entry Draft. They’re not quite loaded for bear, but they’re not quite blowing it all up. And they’re now in the Metropolitan Division with the Columbus Blue Jackets, so I need to start paying attention to them. Starting from the top: How can a team that’s 27th in goals for and 16th in goals against be .500? Shouldn’t they be worse than that? Ah well, the Blue Jackets are only two standings points behind the Canes. As best I can tell, the team is largely built around their two Staal brothers, Eric and Jordan. Eric is a homegrown talent, while Justin was lured out of Pittsburgh. Both play center, and both are in the top five scorers for the Canes. That said, the top goal scorer (take out assists) is youngster Jeff SKinner. Past that, they have free agent signee Alexander Semin, who used to run with Alxander Ovechkin in Washington, and an impressive offensive defenseman in Andrej Sekera. In the "Former Blue Jackets" category, defenseman Ron Hainsey is on the blue line and center Manny Malhotra – who I’ll argue was the best center the Blue Jackets ever used with Rick Nash – is salvaging his career after a terrible eye injury as a Vancouver Canuck. The Canes seem to be like that – picking up a lockout-tainted Hainsey (Ron was very active on the NHLPA side and likely landed himself on more than a few NHL Santa "naughty" lists) and a rehabilitating Malhotra. There’s more than a little of the NFL Oakland Raiders Al Davis in those moves (and others on the roster, like defenseman Mike Komisarek and Semin), and I like that approach. There are a number of veterans who still have a lot to give that can be pulled off the scrap pile. Lastly, there’s center Riley Nash. I only mention him because of the jarring nature of seeing the Carolina beat writers on Twitter mentioning that "R. NASH" is on the ice for the Hurricanes. Of course, I read that and automatically think "Rick Nash," former Blue Jacket captain and curent New York Ranger. Catches me just about every time. In net, there appears to be a true tandem between tonight’s apparent starter, Justin Peters and former All-Star Cam Ward. Peters has 17 starts, a -8-3 record and a .930 save percentage. Ward has 16 starts, a 5-6-5 record and a .901 save percentage. You can’t start a preview for tonight and not at least mention that the Blue Jackets roared back from their Thursday night meltdown against the Philadelphia Flyers with a dominant performance – wire to wire – against the Flyers on Saturday night. What could have been a deep psychological wound for the team now can be looked at as a speed bump for the CBJ. Whew – disaster avoided. As for tonight, we’re back to life without Marian Gaborik and Matt Calvert. Gaborik broke his collarbone minutes into his much-anticipated return on Saturday night, and Calvert is out for 2-3 weeks with a sprained shoulder. Personally, I’m more concerned about the spillover effects on the team of losing Calvert. He’s one of the team’s "motor" players, and the coaches need him on the ice to push the other players. I’d say that the loss of these two is catastrophic, but this is one odd team. They play better when their roster is depleted. In that sprit, I’ll say: Watch out! While I don’t think any Blue Jackets fan can help themselves by watching for a Ryan Johansen goal every time the kid steps on the ice (He’s up to 14 goals, having potted another couple over the weekend), I’m going to try to look more closely at that "other" returning player from Saturday, defenseman James Wisniewski. I didn’t get to watch that game all too closely, so I’m hoping that tonight gives me the opportunity to catch more of Wiz. He’s still the team’s fifth-leading scorer, having missed seven of Columbus’ 36 games, and grabbed a quick assist in his first game back. There’s something to Wiz’s presence on the ice from an offensive perspective, and I’m looking forward to seeing what he can do against the Canes. That, and I’m very interested in seeing what he can do on the defensive end. First off, it’s Monday…so that means we get a fresh "Blue Jackets Slap Shots" at 6PM. Tune in to see what Brian Giesenschlag and his team of contributors have in store for you. 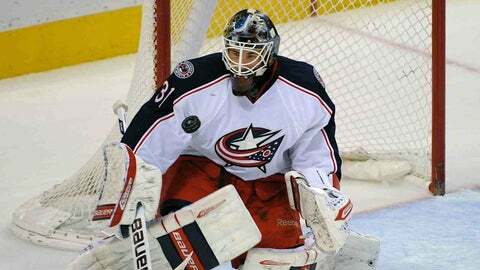 – The Hurricanes and the Blue Jackets drop the puck at 7PM with Jeff Rimer and Bill Davidge in the booth. Columbus is 1-1-0 in the first two games of this key five-game Metropolitan Division stretch. Can they make it two wins tonight? Let’s hope! Go Jackets!